If you’re not familiar with video editing and camera settings then shooting slow motion video with a GoPro can perhaps be a little frustrating.You may keep wondering why your new GoPro Hero4 slo-mo’ed footage is jittery and jerky. It may be because you need to sync the camera and editing settings. MicBergsma is here to help you out in this situation though: in his short GoPro Quick Tip he demonstrates the best way how to get the smoothest videos possible. Do you have any tips on shooting slowmo video? Feel free to let me know in the comments. In that specific scene Quicksilver has to get himself, Magneto, Wolverine and prof. Xavier out of a maximum security facility. Of course, this was the perfect chance to have some fun so Quicksilver knocks the hats off the security, makes them slap each other and tastes some of the food that is flying around. Wait a second.. Bullet Time? It may be quite interesting to see how they shot it. Interestingly, it did not involve an array of cameras but a ton of CGI and a few huge fans instead. We don’t often think about the hidden beauty that nature provides if we carefully (really carefully) look into things. This is not the case with Beautiful Chemical Reactions, they provide us with a very careful look into what happens during those magical moments of chemical reaction. Have you been to the beach in the last few years? If so was the only thing you could think about was “Please don’t let that jellyfish touch me! Please don’t let that jellyfish touch me! Please don’t let that jellyfish touch me!”. And was that because of those slimy tentacles that smear venomous pain-inducing mucus on you? I had those thoughts too. But it turns out that if you actually take a strong microscope coupled with a 2,200 fps Phantom Miro camera you see that it is not the slime that hurts you, it is millions of small syringes that extend from the jellyfish and inject venom into your skin. It’s been forty five years since Neil Armstrong and Edwin “Buzz” Aldrin became the first two men to walk on the moon. The more unbelievable fact for us, however, is that apparently had cameras that could run at five hundred frames per second back then, as well. 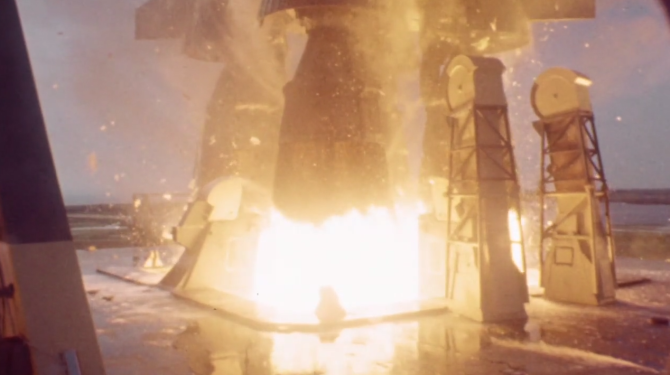 For thirty seconds, the launch of Apollo 11 was filmed by a camera on location at 500 FPS. The ending result was a stretched out to about eight minutes, and gave us one of our sharpest looks ever at the launch of a spacecraft. Obviously, the content shown is a breathtaking sight on its own, but I really found myself focusing on the aesthetics of the video itself after a few repeat views. How amazing is it that we’re able to see footage this sharp, fluid, and clear from 1969? Shot originally on 16MM film, the film was spotlessly converted to HD for us to be able to view online. Check it out for yourself, and stick around for the commentary by Spacecraft Films‘ Mark Gray. For a video that lasts just under ten minutes, what you learn for nearly its entire duration is half of the enjoyment. Seriously though. With just how expensive film should have been at that point, NASA must actually have been receiving sufficient funding back then. When we came across this video, we were captivated. I’ve always been in awe of ballet dancers. They possess the most amazing hidden strength, machine-like precision, and grace beyond words. What happens when you ask six incredibly talented ballet dancers to show you their hardest move and film it in slow motion? You gain an even greater appreciation for the skill they possess. This is exactly what Jason Aldag from the Washington Post’s PostTV did and the results are fascinating. Over the years we featured quite a bit of slo-mo footage, but I think that this one breaks the record with an astounding 10 million (10,000,000) FPS movie of a small ball hitting glass. The camera is so fast that it looks as if the ball is not even moving. The movie was created with the HyperVision HPV-X Camera of Shimadzu. If you were wondering, the camera (including the power unit) weighs about 11.5 kilos and can only take 256 conservative photos @ a horrible resolution of 400×250 at that mode.